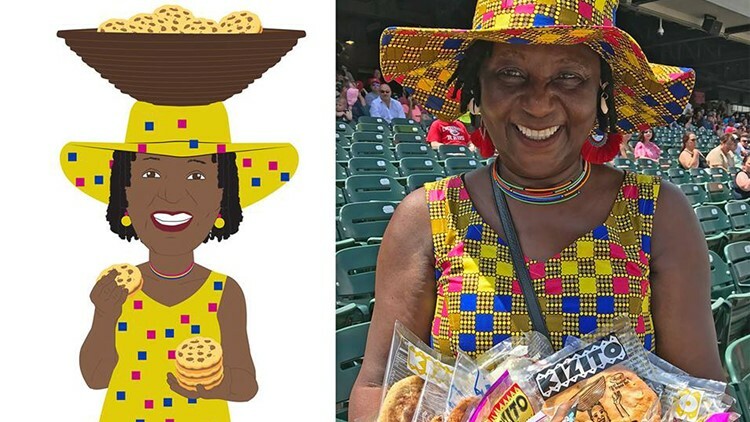 LOUISVILLE, Ky. — If you have been to a Louisville Bats game, you know it is hard to miss the Cookie Lady. She is always wearing a smile and carrying a basket full of her famous cookies. This year the Louisville Bats are celebrating their 20th season and decided to honor Elizabeth Kizito with a Cookie Lady bobblehead. “We wanted to pay tribute to some of the people who have made this place to special for us,” a spokesperson for the Louisville Bats, Alex Mayer, said. Kizito of Kizito Cookies has been selling her cookies at Louisville Slugger Field since it opened in 2000. She says carrying her cookies up and down the steps is hard work, but it has helped her business tremendously. “When I'm feeling down, I go to the ballpark and people really pick me up and make me feel better about myself,” Kizito said. Kizito said she is excited and honored to have a bobblehead made after her. “I think it says a lot about Bats Baseball fans in Louisville that they think of me with so much love,” Kizito said. The first 2,000 fans to arrive at the game against the Toledo Mud Hens on August 2 will receive a Cookie Lady bobblehead. “Thank You Bats Baseball for making me successful, for making me a bobblehead, but mostly, for making me happy!” Kizito said. You don’t have to wait until baseball season to get your hands on Kizito Cookies. Visit the bakery at 1398 Bardstown Rd. in Louisville. Do not let the boarded-up windows fool you. The bakery is still open, but Kizito is waiting on new windows. In an act of kindness, someone anonymously added artwork to the boards, bringing the storefront back to life until the windows are replaced.